What's a movie all about? If moviemaking were a science, then it would be a science. But guess what? Quite often elements that have nothing to do with the movie itself -- timing, release pattern, marketing, advertising -- have more to do with what makes the thing a hit or a flop. Especially today, when pictures are in and out of theaters before the public has a chance to decide whether they're worth seeing -- much less worth seeing again. Repeat business, which used to be a big factor in determining a hit, doesn't really kick in until the DVD release anymore. But there are still would-be alchemists who imagine they can scientifically -- or, at least, statistically -- measure the ingredients of a successful movie. Take Professor Dean Simonton at UC Davis, for instance. He says he's isolated the components of the magical formula that accounts for a movie's appeal, with audiences and with critics. Can you guess what they are? Of course you can. Movies are supposed to be about getting lost in emotion. But one scientist has broken down the film industry to cold, hard facts. A psychology professor at the University of California, Davis, has done a statistical study of thousands of movies to determine what makes them critical darlings or box-office hits. Films that earn awards and praise from reviewers tend to be R-rated and based on a true story or a prize-winning play or novel, says professor Dean Simonton. The original author or the director usually have written the screenplay. Big-budget blockbusters — whether they're comedies, musical, sequels or remakes — don't ordinarily draw acclaim, Simonton found. Neither do summer releases, PG-13 movies, movies that open on thousands of screens or ones that have enormous box office numbers in their first weekend. "I had this hope that there was a difference between blockbusters and really great art films — films that can be considered great cinematic creations," said Simonton, who presented his findings Friday at the annual meeting of the American Psychological Association in San Francisco. "It was gratifying to find out they're very, very different and you can find out what's different about them." Simonton says he's not a movie buff — "I'm a consumer like everyone else" — but in his longtime studies of genius, creativity and leadership, he started compiling data about the collaborative process of filmmaking in 1999. He's also done a study comparing the Oscars with the Razzies. Now, before you say "Duh" (and you should), Simonton says he's not a movie buff but "a consumer like everyone else," and he does admit that, "All these things are just statistical relationships — there are always exceptions to every finding you have." How true. And close empirical (and statistical) analysis should indeed be a part of the study of how movies work. See Cinemetrics for a fascinating and useful database cataloging the average shot length of many movies. Such facts and tools can be used to examine stylistic features and trends, and make specific notations about films in any number of ways. And, natually, valid film criticism should always be rooted in direct observations of, and examples from, the movie(s) under scrutiny. But it's one thing to study and dissect films; it's something else to present analysis as a recipe or a prescription. 1) They're in the risk management business, not the entertainment business. Which means that studio execs are less likely to go with their guts, as the moguls of old were known to do on occasion, than to rely on previously successful formulas in attempts to cover their asses in case they should fail. After all, the studio bosses no longer work for themselves. They are beholden to their corporate bosses (at General Electric, Viacom, Newscorp) and, if they're public companies, the shareholders. As Simonton says, "Hollywood falls back on sequels and remakes. Even though you've seen them before, you know they've succeeded in earlier versions." Columnist Mark Harris in Entertainment Weekly covers some of this same ground in a piece called "Buzz-Lite Year," in which he says of these One Weekend Wonders: "It's bad news for moviegoers that studios can now make money without having to worry about that pesky variable, word of mouth." A slight exaggeration (word-of-mouth travels a lot faster in the days of blogs, e-mail, mobile phones, and text-messaging) but he's basically right. For most of the corporate life of the cinema, executives have done their darndest to figure out a way to manufacture movies without all that troublesome talent: writers, directors, actors, and anybody who belongs to a union. They joked about it, but if they could have done it, they would have. And there's been a lot of press the last couple years about how studios are theoretically squeezing critics out of the box-office equation (predicated on the unsupported assumption that critics were ever a significant part of it in the first place). Now, the corporations can make a profit on a movie even without you, the audience. With pre-sales of what were once "ancillary rights" (DVD, cable, foreign theatrical distribution, etc.) some movies are in the black before they're even released. Sometimes it seems the only thing that can really hurt a movie investment is to actually show the picture to people. 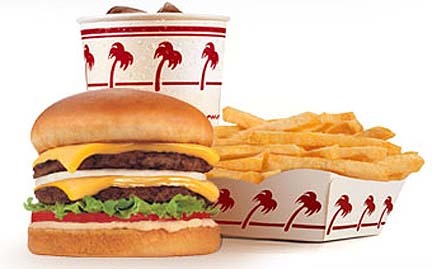 Best to get it In-N-Out before anybody catches on to what's actually being sold. (I kid to some extent, but to make a point.) Remember, the theatrical release is basically a publicity stunt, an elaborate marketing campaign to prepare for the TV and DVD releases, where the real money is. And, by then, it doesn't matter so much how "good" the product is. People are a lot less picky and more forgiving when it comes to watching movies at home on cable/satellite or DVD than they are when they make the effort to go out, stand in line, buy tickets, and watch a movie in theaters.